This second audiobook in the series is even better than the first, giving more detail and history of the world while still moving the story forward and creating a tale that keeps you totally enthralled. Hannah continues to develop her skills and meets some interesting people along the way. They begin to recruit for the upcoming confrontation with the Duke and we see more of what the Duke has planned, as well as the horror of his factory. Sal is still growing and I am sure that he will play a bigger role in the future as he has the potential to be such a great character. There are scenes that have your heart racing and others that make you laugh out loud and the narrator does a brilliant job of capturing all the nuances with her voice and giving life to the excellent characters the authors have created. I can’t wait to see what happens in the next book. I am still very brand new to the Kurtherian books. In fact, this is only the 2nd book I have read. I think I may have to dive in from the beginning eventually so I can get the whole experience, but first I will need to finish this particular series because I am hooked! The first book I was given as a review copy, but I think I am on my own for the rest. The cheapest way I could find to get the 2nd audiobook was to buy the kindle version and the audiobook version. I like that I can Whispersync to the kindle version, so I can read before bed. I am actually glad to be given this as a choice. It is very convenient. Hannah is beginning to get a handle on her magic. She is still learning, but she really is starting to understand how to control her abilities. This book lead us further into the back story of Ezekiel and how he became “The Founder.” We get to see how truly evil Adrien and some of his minions are… especially Alexandra – she is really crazy! Wow. With the way things are going so far, I find it hard to believe Ezekiel didn’t realize the evil that was in Adrian long ago. I am curious what made him so diabolical. Hannah is really a great character. She seems so real to me. She has this attitude that I just love! She will listen and try to follow what Ezekiel tells her, but then ends up doing her own thing anyway, which sometimes can be quite hilarious. Parker is also a memorable character. He is such a good person and really stands up for what is right. I don’t know how he manages to put himself in the situations he gets into and even more – how he gets out of them! There was one point, about maybe an hour away from the end when I was driving home from work, that I had to pause the book because I got too involved and felt too stressed out to listen anymore! I waited until I got home so I could pace around my kitchen – much safer than driving!! It really is a great book! So many twists and turns. I can’t say enough good things about Kate Rudd as a narrator! I want to continue to listen to her for a long time! She really brings these characters alive. So good! I need the next book right away. The storyline is very well developed and the characters are so endearing that you just want to find out more. I am so glad that although these books could be read as standalones that, together, they are making a great series. The narration is extremely well done. These books are so absorbing that you can't put them down and you lose your self in this new world that the authors have created. I can't wait for the series to go on. I received this book from the author/editor/narrator of my free will for an honest review. and if you haven't picked up this series yet... ehat are you waiting for. I'm in love with it, this second book is so fluid with the first one that I was like yes we are progressing more into the plot and wao that plot is on fire I can't wait to know more about what is happening, I can sense the battle coming to our heroes doorstep and want to know in what it will end. the characters continues to amaze me it's like having a friend that is telling you their story. other thing that made my day it's the easy way you can be in sync with the narrator it's awesome, definitely a pick up for your library. 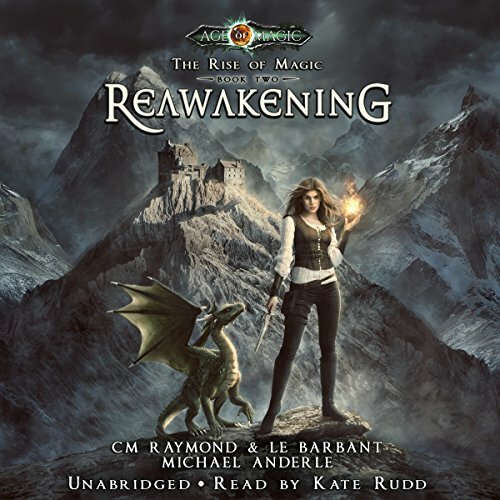 Reawakening: The Rise of Magic, Book 2 my second read/listen from author C.M. Raymond picks up where Book 1 left off. I love this incredible amazing story, the personality of the characters and the voice inflections of the narrator. Well developed characters, a storyline that grew on you as you continued until you couldn’t wait to read the finish. I'll be reading more by this author when I buy more of his books. I’m sure that author C.M. Raymond has more good writing waiting in the wings! A great book. I cannot wait to read the next one. A must for fantasy lovers of all kinds. Hannah, Ezekiel and the rest are growing stronger, but now it's time to face Adrian. I received this audio book for free at my request and voluntarily reviewed. can't wait for the 3rd and 4th book! Hannah and her team are like TQB with as much fun and excitment as those books in the KGU. woo hoo!